Last time, I reflected on powerful words written by Dr. Albert Wu in 2000. If you haven't read his essay, “Medical error: the second victim” yet, it's brief and I highly recommend it. Download it here. Today I want to take that reflection further and begin to explore the concept of the “second victim” in greater depth. I've found this notion enormously useful as I consider the impact on healers of unexpected patient outcomes. No doubt, I'll return to it repeatedly. These words ran counter to prevailing assumptions that physicians should and could somehow divorce themselves from the suffering of their patients. Nonetheless, the medical community was clearly primed and ready to hear them. Since that time, there has been an explosion of research around the experience of the second victim in healthcare. And, while Dr. Wu referred to physicians in his essay, the literature which has evolved since 2000 is much more expansive, frequently focusing on nurses – the very front line, after all – and including all healing professionals. Interestingly, the foremost authority in this domain is not in healthcare at all. An international expert in safety science, Sidney Dekker was first a pilot. Born in Amsterdam, he now lives and writes in Australia, but has made his mark all over the world. He and others describe the second victim as a practitioner who is involved in an incident that harms or nearly harms someone else, thus becoming traumatic for that practitioner in some way. Note carefully that even an incident that nearly harms a patient – a wrong drug dose which does no harm, for example – can create a second victim. Furthermore, the practitioner need not actually be responsible for the harm. As long as they believe they may have harmed someone else, or even believe they failed to protect someone else, they are at risk for the emotions and responses common to second victims. And get this: the “practitioner” need not be a medical practitioner at all! Firefighters, police, and military personnel become second victims. Pilots, air traffic controllers, and members of the aerospace industry are at high risk. Even construction foremen and owners of manufacturing plants can be second victims, with all of the emotional and spiritual turmoil that pertain to the experience. 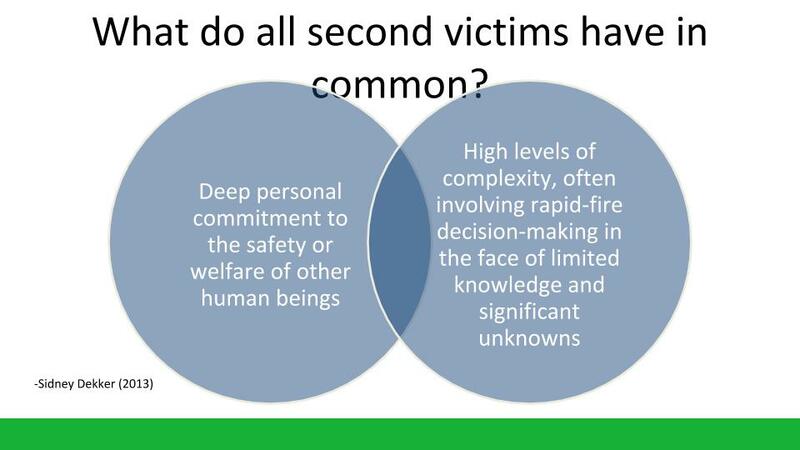 What makes a second victim? Work where safety is generally critical, characterized by high levels of complexity, frequently involving rapid-fire decision making in the face of limited knowledge and significant unknowns. Doesn't that describe our work as healers perfectly? Without a doubt, our work involves an abiding commitment to the well-being of others. For many of us, that personal commitment to our profession runs so deep as to form an essential element of our identity. And yet, what could possibly be more complex than the human body? Won't we forever confront limited knowledge around the nature of health and disease? And what about the unknowns related to what our patients can or will reveal, or what we ourselves can perceive? If we stop and think about it, the intersection of a deep personal commitment to the welfare of other human beings plus high levels of complexity together with rapid-fire decision-making in the face of limited knowledge and significant unknowns has to mean that eventually we will find ourselves in a hazardous place. There is virtually no way around it. In future posts, we'll explore more deeply the experiences of second victims, who they are, and how they recover. The main point I want to drive home to you today is that you are a hero. Humility, in its best sense, is and should be valued in healthcare, so we may not be prone to think of ourselves as heroes. That doesn't change a thing. Reality is that you are. By virtue of the work you do and the way you do it, you are a hero. By your willingness to weave together, in your very own life, the combination of a deep personal commitment to the welfare of humanity and work that combines challenging decision-making despite limited knowledge and significant unknowns, you are. Trust me on this one. You are a hero. Do you need some support as you recover from an unexpected outcome or malpractice lawsuit? Thrive: Insight Coaching may be the tool you seek. Looking for a physician speaker to explore how we manage adverse outcomes and litigation for your next conference or event? Read more about my public speaking here.